Purchasing Co-ordinator – There is always a high demand in for purchasing coordinators and assistants throughout the private, public and volunteer sectors as there will always be a need for savvy purchasers looking for a good deal which is essential in a difficult economy. I write with respect to the vacancy advertised in Learnist.org for Purchasing Coordinator. Please find enclosed a copy of my CV and several recommendation letters. I have been in my current role for 3 years, during which time I have assisted in implementing a new purchasing system incorporating a sophisticated database system which saved our team about an hour of paperwork every day. I am now looking for a role which will offer me new challenges which I think this role and your business will offer. Please contact me if you have any queries or would like to discuss any of these matters further. 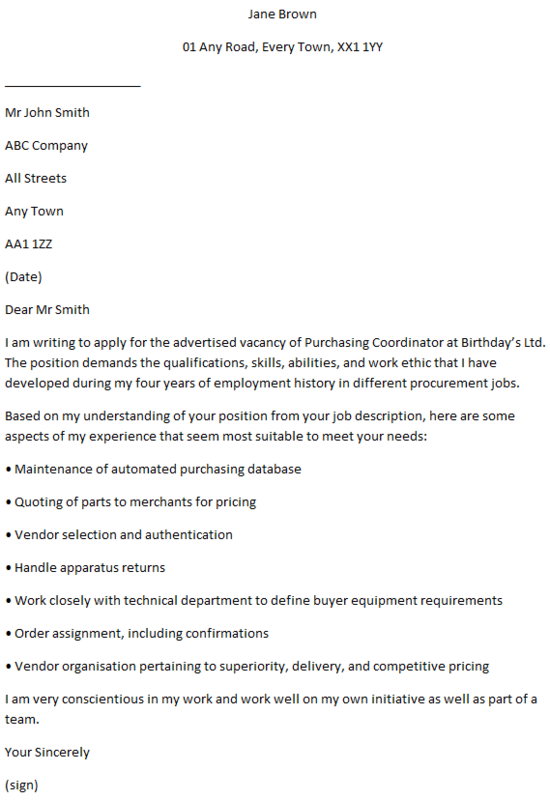 I am writing to apply for the advertised vacancy of Purchasing Coordinator at Birthday’s Ltd. The position demands the qualifications, skills, abilities, and work ethic that I have developed during my four years of employment history in different procurement jobs. As a recent graduate with an extensive experience in purchasing, I am eager to combine my practical and academic experience to contribute to your profitability. I am very conscientious in my work and work well on my own initiative as well as part of a team. As you are looking for an applicant who is able to assist purchasing for your different projects, I hope you will consider my application. Thank you for your consideration and I look forward to a response at your earliest convenience.